Oneplus is constantly revealing, Oneplus 2's specifications week by week, increasing the hype. So far we know that, It's going to have an Snapdragon 810(v.2.1) processor, a fingerprint sensor, a Usb type-C connectivity port & a whopping 4GB of Ram ! They're increasing the hype day by day, Well I can assure you this is going to be huge. 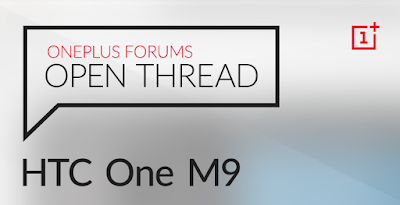 Just few moments from now, Oneplus started taunting over social media, asking their fans regarding " Htc One M9 ". In particular they're asking people over their design language, whether people like it or not. Okay, Why is it so ? Let's find out. Well these days if you say the name HTC, the first thing that comes to your mind is "Design" followed by those amazing Front firing Boomsound Speakers! Well even though camera was a let down, the phone's Software is minimalistic & almost as fast as anything close to stock Android. Ohh & i can bet what Oneplus is trying to say is, "We are going to provide you the features you liked from Htc One M9, at a much lower price "
Also see : Oneplus 2 will feature a whopping 4GB of Ram!